After seeing several dozen, nice, kitchen back-splashes and helping my in-laws with theirs, I decided to work on my own while the kids and wife were visiting relatives one weekend. This how-to shows the process I underwent. The kitchen had been sitting alone: color-less and style-less for 4 years since we bought out house. 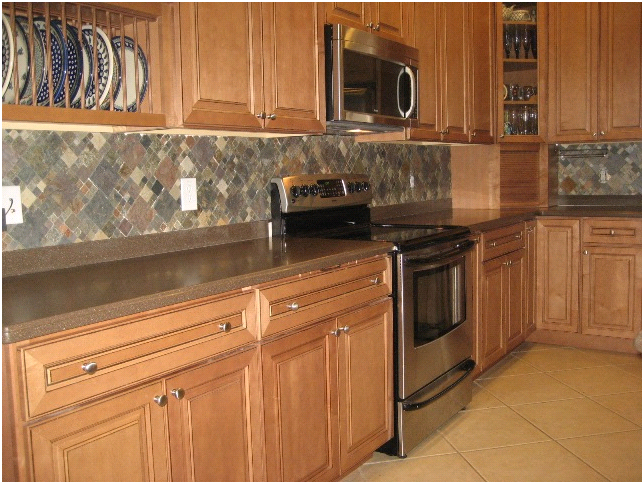 It needed something colorful and dark to really make the mocha-maple wood cabinets pop. Simple paint wasn’t going to do the job. I wanted something 3 dimensional and textured. 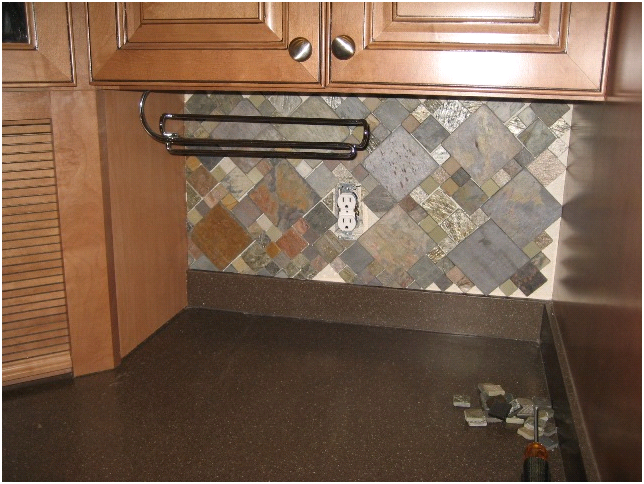 I wanted a mixture of tile sizes and colors to bring more interest to the eye. I visited the local Home Depot and Lowes stores and decided on mixed colors and sizes of slate. 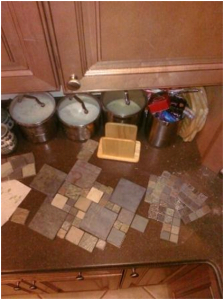 The 4″ tiles came in a box of individual tiles, but the 2″ tiles and 1″ tiles only came in sheets glued to a net backing. This job would have been much easier if I hadn’t decided to mix up the sizes. 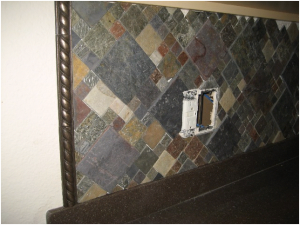 I began by cutting the net backing off of the 2″ and 1″ tiles. This ended up being quite a bit of work. Once I had several sheets worth of tiles separated and ready, I began to adhere the tiles to the wall from left to right. I tried to randomize the tile sizes as much as possible, allowing same size tiles to touch here and there randomly across the field. On the left side, I needed a side border so that the tile edges wouldn’t be seen. I chose a simple rope pattern in a bronze color. The biggest problem I had was the non-uniform sizes of the tiles. 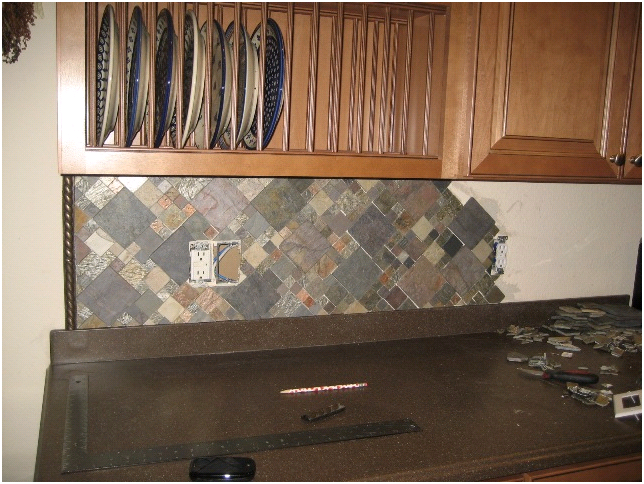 No 2 4″ tiles were the same length, width or thickness. This causes problem all over. I needed to open up the gaps between the tiles slightly to allow for the variation. Some touched, some ended up being 1/8″ apart or more. Once I had a running field of tiles coming along, I tried to fill in the holes with cut tiles. All of the little triangle filler pieces were cut on a 10″ wet saw. It was painstaking work in making the cuts. Overall, I had two fields of tile: One on each side of the appliance garage. Below is the section to the right of the appliance garage. I ended up with some very vibrant orange, red, brown, white and blueish tiles. The camera doesn’t do the color mixtures justice. 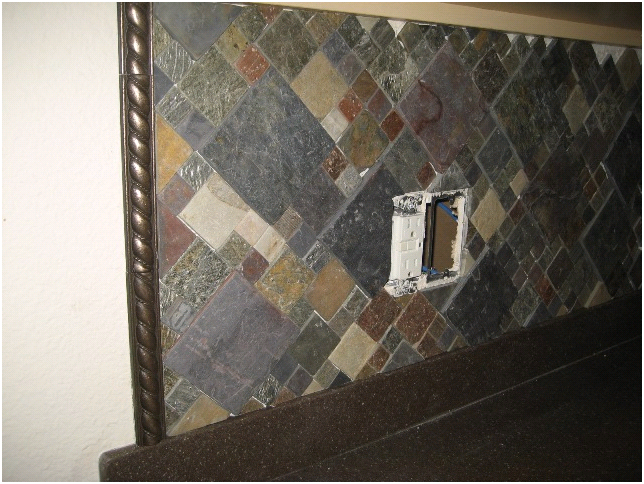 Here is the tile before grouting. The tile I used from Home Depot required a 12 hour set time. I waiting until the next day to grout the tile. 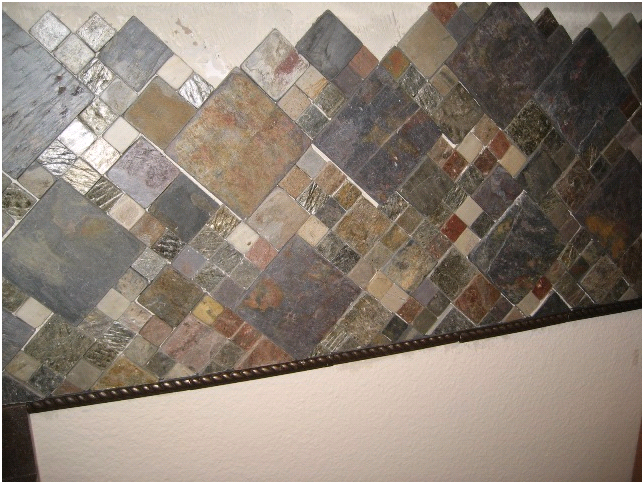 For grouting, I used a dark gray. You use a rubber trowel to mush it in the cracks in 2ftx2ft sections and then come back over it with a wet sponge to rub off the excess grout. You must frequently rinse and squeeze out the sponge in a bucket of water. After about 30 minutes, you need to then go back over however much you have completely up to that point and rub it down a second or third time with the wet sponge to clean off the surface of the tile. After the grouting, and a dry time of another 2 days for good measure, I sealed the tile with a glossy sealant available at any home improvement store. 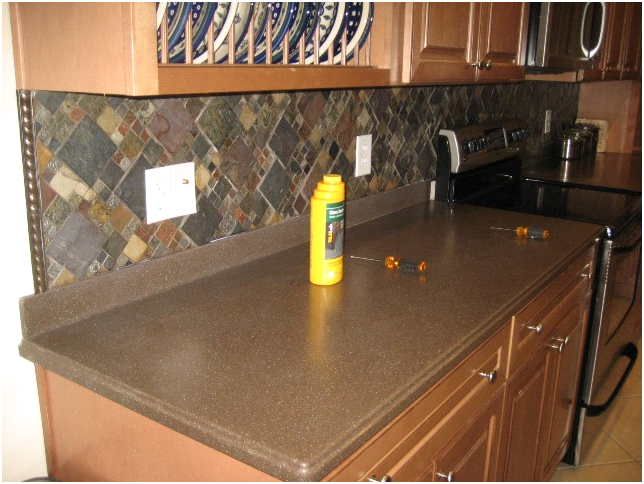 It was about $9 a bottle and I only used a portion of a bottle for the entire backsplash. This makes it much easier to clean up splatters and spills like tomato sauce. 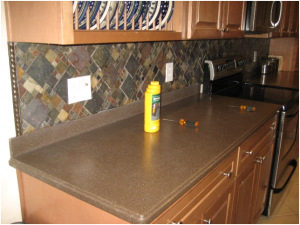 I used masking tape and newspaper to mask off the countertops to avoid horrible messes on my Corian. As for how to apply the sealant? I just used a cheap 3″ paint brush that you can buy from Home Depot or Lowes in packs of 10. You just slop the sealant on. I was afraid that the glossy sealant would be too glossy but the slate soaked it up very well and left only a semi-glossy finish. This entry was posted in Home Projects, Kitchen Remodeling and tagged backsplash, home project, kitchen, remodeling, tile. Bookmark the permalink. It would be better to do the whole floor and set the cabitenry on top of that. This is because you may eventually want to change the layout of the kitchen and it would be very difficult to find matching tile later on. 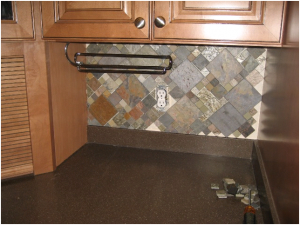 Also, you get the moisture protection of having the tile along the entire floor. That’s what my tiler did when I redid my kitchen. It was more expensive, because it required more tile. 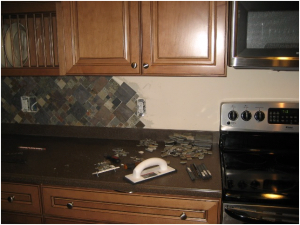 But, if you’re replacing all the cabinets, it’s definitely the better way to go.If someone replaced the kitchen floor without replacing the cabinets, it obviously makes sense to just tile up to the bases of the cabinets. And, that’s probably what happened in your kitchen when that floor was put in.